A man on who climbed a motorway information board has been arrested and is still in police custody. (Image: SWNS). Police have confirmed a man suspected of causing a public nuissance is still in custody for questioning following his arrest. Hundreds of thousands of motorists were delayed by a man who climbed onto a motorway gantry board and refused to come down, forcing police to close all Southbound lanes for 28 hours. Trained officers negotiated with the man over a 28-hour closure of the southbound carriageway near East Midlands Airport. Police arrested the man on suspicion of causing a public nuisance when he came down from the stanchion at around 5pm yesterday (Monday, June 13). He had scaled a ladder to climb up there at about noon on Sunday and had written protesting messages across the back of the information board. 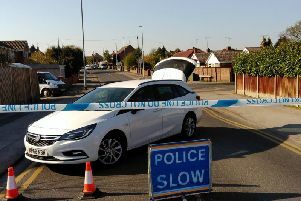 Leicestershire Police closed the southbound carriageway between junctions 23a and 22 as trained officers negotiated with him, and said he was due to be interviewed today. Assistant Chief Constable Phil Kay said: “I do not underestimate the incredible gridlock and massive inconvenience that this incident caused to motorists throughout the UK.